The outcome of the constitutional referendum in Italy and the resignation of Prime Minister Matteo Renzi overshadowed last week’s Eurogroup meeting on Greece. The December 5 monthly reunion of finance ministers took stock of the second review currently being carried out by Greece’s official creditors. The agreed roadmap of short-term measures to make the country’s sovereign debt more manageable was the major take away. But the debate about additional fiscal consolidation, primary surplus targets and uncertainty over the IMF’s programme involvement continue to define the agenda. The December 5 agreement with the European creditor institutions confirmed the primary balance target of 1.75 percent of GDP. What remains controversial between the Eurogroup and the Greek authorities are the specific fiscal measures, to be included in a staff-level agreement, necessary to reach the agreed fiscal targets for 2018 and beyond, namely a primary balance of 3.5 percent of GDP. While the Eurogroup did not show any downward flexibility on the numeric target, the IMF maintains the view that such a level of primary budget surplus is neither politically feasible nor socially sustainable. Athens had hoped there would be an agreement to lower the fiscal targets for 2018 and beyond. The IMF called for additional fiscal measures, such as lowering the tax-free threshold from the current 8,635 to 5,000 euros. This demand is also supported by the World Bank so as to enlarge the tax contributor base in Greece. The IMF further argued the case for additional pension cuts and NPL resolution, while the Eurogroup emphasised public sector reforms, for example, in the labour market; the opening up of closed professions; and the removal of barriers for investment. The negotiations with the creditor institutions over this diverse range of fiscal and structural measures could prove politically toxic for Prime Minister Alexis Tsipras in the coming months, particularly against the background of a dystopian political environment in Greece. The post-programme policy debate has thus started in earnest. The Eurogroup meeting identified a roadmap that is shaping this emerging narrative. Preparation upon entering into technically complex and politically charged negotiations will thus be critical. This aspect is to be borne in mind as the Greek authorities will face a critical test of preparation in July 2018 when the third programme is due to expire. On the one hand, preparation will then either focus on the negotiation strategy adopted in Athens towards the rationale in favour or against a fourth programme. On the other hand, strategic thinking will have to go into the approach Greece needs to take with its international creditors to secure an orderly exit from the current MoU and to negotiate the strings attached to such an exit roadmap. If a timely exit from the third programme is to be achieved by the Greek authorities, much will depend on the post-MoU policy prescriptions and obligations. Supervision of compliance requirements would not end with the conclusion of the third programme. Nor would the focus on fiscal adjustment be terminated. As the cases of former programme countries Ireland, Portugal and Cyprus illustrate, they remain under strict fiscal monitoring by the troika of international creditors. Their post-programme environment continues to be shaped by the capacity of official lenders to demand fiscal, banking sector-related and structural policy adjustments. Given Greece’s bumpy track record on implementation during the three programming periods since 2010, the international creditors will continue to demand fiscal measures and structural reform obligations after 2018. The feasibility of such a package, in particular its political acceptance by a Greek government, is already shaping up as the major discussion point between Athens, Washington, Brussels and Frankfurt. IMF: to stay or go? Since the signing of the third MoU with Greece in July 2015, the IMF has consistently withheld a decision about its own financial participation in the programme. At the meeting of the Eurogroup this week, the IMF representatives only confirmed that they would recommend to their executive board a new financing arrangement for Greece after the second review is concluded. This would not be before the end of 2016. Based on its participation in the first two programmes, the Fund is the second largest source of institutional financial assistance to Greece. It has contributed roughly 28 billion euros of creditor finance, thereby exceeding Greece’s allocated funding quota by over 1,000 percent. Greece is currently the IMF’s single largest creditor. In June 2015, finance minister Yanis Varoufakis initially delayed and then suspended a repayment obligation to the Fund; an unprecedented credit event for a European IMF member. That experience still resonates strongly in the hallways of the Washington-based lender. It also explains why many inside the Fund are reluctant to provide further financial resources to Greece. These voices rather emphasise the Fund’s need to be repaid on time and in full. Even if the Fund were to reach a positive decision to participate with financing resources of its own in the third programme, one must be mindful of the following: the decision will be characterised by the Fund becoming a net extractor, not a net contributor, of financial assistance to Greece. Put otherwise, the amount made available to Athens will be measured against Greece’s obligations and repayment calendar, thereby making sure that the Fund is repaid in higher volumes than what it is financially committing. Therefore, the IMF’s repeated advocacy in favour of substantial debt relief for Greece is not without self-interest. Making the case for debt relief while emphasising that the Fund itself would not participate in such an endeavour has frequently irritated the European creditor community. But the primary concern of the IMF leadership is to safeguard its institutional status as the senior creditor institution. Put otherwise, the Fund calls on the European creditors to provide debt relief in order to make sure that the IMF gets repaid on time by Greece. The proposed short-term debt relief measures agreed by the Eurogroup at this week’s meeting were submitted by the European Stability Mechanism (ESM). They are based on the principal that any current or future debt transactions will not have any direct costs for countries participating in financing arrangements for Greece. The first set of measures focuses on reducing the interest rate risk for Greece. This is addressed via bond exchanges, interest rate swaps and matched funding. The proposed bond exchanges and interest rate swaps imply additional costs in the short term. These will have to be borne by Greece. The second measure includes the extension of maturities. More specifically, the weighted average maturity of the loans made available to Greece in the EFSF programme from 2010 will be extended by four years, from 28 years to 32.5 years. The third measure is a waiver for 2017 of a two percent step-up interest rate margin of a loan portion linked to old privatisation targets in the first and second programmes. These short-term measures can contribute to easing Greece’s debt profile, in particular concerning maturities and interest rates. Eurogroup chief Jeroen Dijsselbloem said that the medium- and long-term measures would only be finalised in 2018 when the current programme is set to expire. This roadmap implies that no medium-term debt relief arrangement can be finalised before the full implementation of the current MoU. It also implicitly takes into account the electoral calendar for 2017, with early elections looming in Italy, the general election in the Netherlands, presidential elections in France and the federal elections in Germany in the autumn. From the Greek government’s perspective, the short-term debt relief proposals fall well short of what Tsipras was seeking to achieve, such as a partial debt write-off (in nominal terms) and longer grace periods for repayment obligations. It remains doubtful if he can sell these measures as a major victory in the government’s debt negotiations with the creditor institutions. Last week’s Eurogroup meeting again illustrated the pitfalls that arise when a government delays replacing slogans with a concise strategy. Greece’s debt crisis was really the first public crack in the European Union’s armor and one that has yet to be repaired. If you want to understand why anti-EU sentiment and nationalism have developed in many of these countries you don’t have to go to migration or other controversial topics. Simply go back to the start and look at Greece and how it has fared after adopting the EU’s different austerity terms. The Greek experience with austerity-linked financial support from the EU has been painful, and making matters worse, rather ineffective. 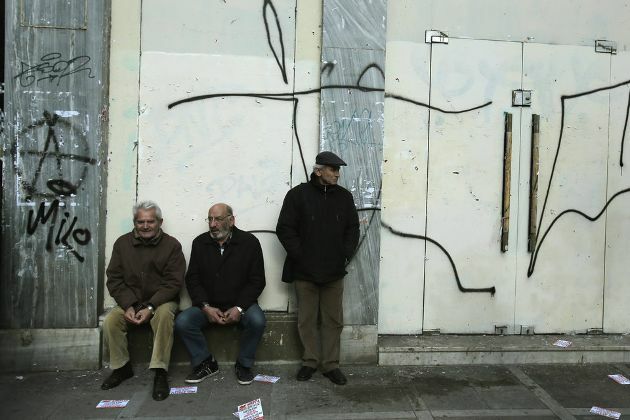 While Greece is on the periphery, its problems are hardwired into the entire EU, and those problems are spreading.